Creating a table of contents is a crucial part of writing books, dissertations or any other longer academic papers. It is a detailed roadmap that serves as a tool for readers’ navigation through the paper. A well structured table of contents simplifies the way readers find the needed information which should always be put on a separate page, added after the first page of an academic work and after the abstract. Different academic papers or dissertations might require different styles of a table of contents. Some of them might require numbered and some non-numbered tables of contents, therefore, authors should check if there is any preferred style for the table of contents. The content included in the table of contents should always be clear and not too long. 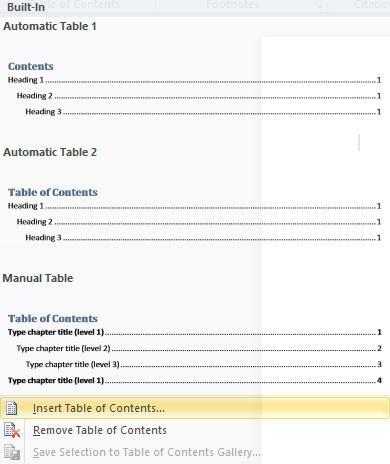 Click on the top of the page where you want the table of contents to be added. Go to the Reference toolbar, then click on the Table of Contents and choose an Automatic Table style. 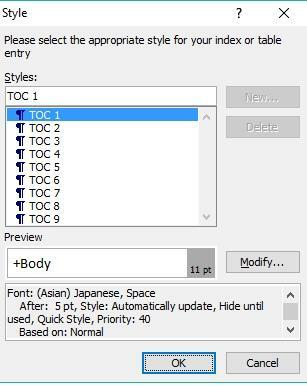 Please, note that if you choose an Automatic Table, each change you will further make in the text will be automatically updated in the table of contents. In addition, there is also an option to click on the Manual Table of Contents style. In this case, Word won’t use the text (i.e. 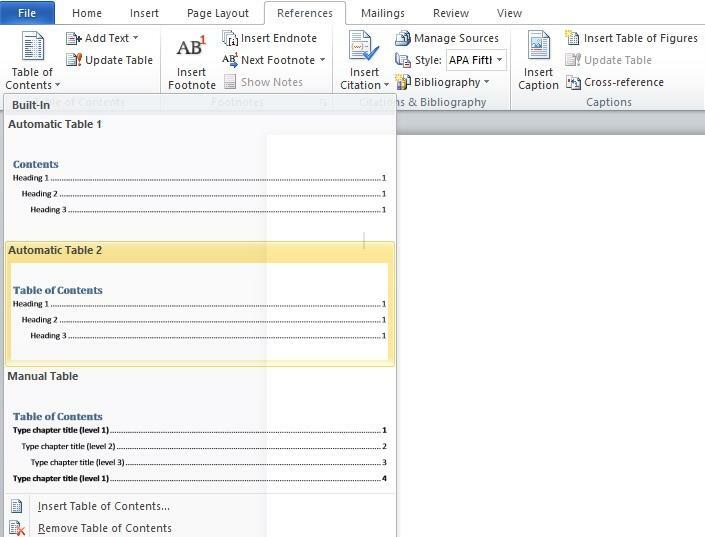 titles) selected previously, but the author will have to manually type each heading into the table of contents given as a sample. You can choose the approach which is more convenient for you. 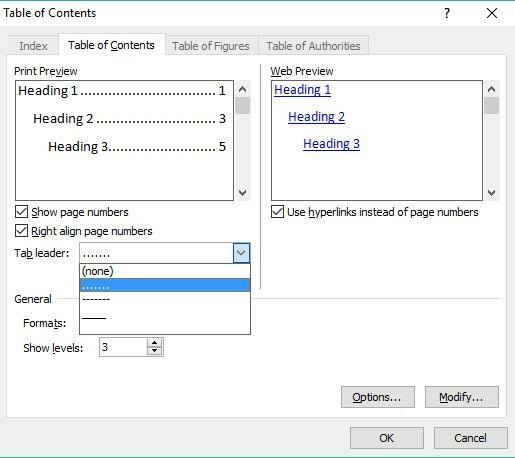 The Table of Contents dialog box will appear where you can choose whether you want to show page numbers or not and choose the most appropriate tab leader. Select what you consider the most suitable for your paper and click OK. If you decide to create a table of contents manually, you should avoid adding the rows of periods between the headings and the page numbers. The most important thing is to keep it simple and clear and you should always check if the page numbers are in the correct columns. 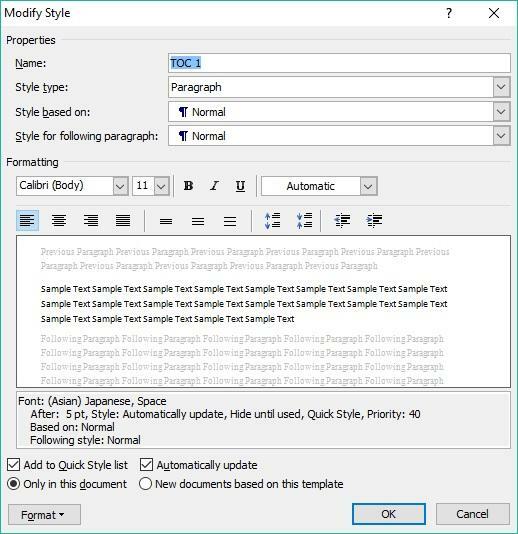 In the case that you use an automatic style, each time you will make changes in the text headings you will not have to recheck if all page numbers in the table of contents are in their place. It will be done automatically and this makes the automatic table style more convenient and more practical to use.